SENS Technology Hear the difference! In the past, Noise Cancelling headsets have set the standard for suppressing unwanted ambient noise using a technology called Active Noise Control (ANC). 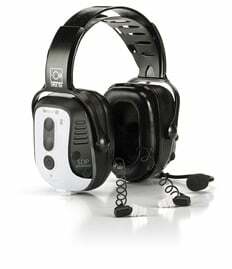 Most people associate Noise Cancelling headsets with those used by consumers on airplanes or other noisy environments to reduce the ambient noise so they can listen to music or sleep quietly. Active Noise Control technology has been adopted by a number of hearing protection products BUT there is an inherent flaw in its application in high noise environments where hearing protection is required. Active Noise Control may reduce noise but it reduces the user's ability to hear speech and remain aware of their surroundings. SENS® takes noise cancellation to a whole new level. By isolating and enhancing speech while reducing harmful background noise, users can hear speech and stay protected whilst remaining aware of their surrounding in high noise environments. SENS® Technology brings low noise hearing experiences into high noise environments by enabling users to communicate effectively, remain aware of their surrounding while protecting their hearing. SENS® delivers three critical benefits in the one technology. It’s simple; if you are looking for the best high noise communication devices don’t ask for Noise Cancelling, ask for SENS®. Learn the right questions to ask and the top features to look for when researching and considering industrial communication headsets. Talk with a high noise communication specialist for a comprehensive needs evaluation and see how Sensear can solve your communication, safety and risk issues.